We will demonstrate how insect discovery and selective breeding can increase sustainable solid waste management practices. Specifically, we will (1) “mine” insect species diversity for new candidate bio-converters, (2) selectively breed high performance strains, and (3) characterize the potential for feeding poultry insects reared on different agricultural wastes. A major outcome from this project will be increased insight into which insect species and improved strains should be used for bio-conversion based on the nutritional and physical composition of a given organic waste material. California produces over 400 crops, which in turn yield many more “organic waste residues” during downstream processing, such as fruit and vegetable pulp from juice industries. Some of these organic waste residues are used as substrate for mushroom production, compost, or as filler in animal feed. However, large portions end up in landfills and are considered a problem rather than an economic opportunity. As decomposers and herbivores, the diversity of insect species includes groups highly specialized in their ability to thrive on different organic substrates, and some of these substrates resemble waste residues from food processing industries. Crickets, cockroaches, soldier flies, bottle flies, and mealworms represent the most widely referenced species in studies of organic waste conversion. We argue that both insect discovery (testing of more species) and selective breeding are needed to further advance the potential of insects as converters of organic waste materials. We have preliminary data clearly suggesting that within a species, individuals show marked range in “adaptation” (measured as growth rate, nutrition uptake and therefore rate of bioconversion) when reared on specific organic waste materials. Such range in adaptation underscores the potential of selective breeding, and the overall project hypothesis is that we will identify and selectively breed specific species with significantly higher adaptation than strains of insects that are currently available commercially. Identify new species for organic waste residue conversion, with specific focus on rapid development, nutrition, high conversion ratios, easy extraction of insect body mass, and conversion of recalcitrant residues (those high in tannins or phenolics). Determine the composition and feed potential of insect biomass following rearing on different performing diet regimes. Establish improved lineages using applied evolutionary techniques, with target goals of increased body mass, development time, or fecundity. Improved lineages performance in these traits will exceed that of their initial populations. Work together with growers, extension specialists, and researchers cooperating in this project to disseminate findings and recommendations through newsletters, and symposia, and publications. Acquiring residues: We targeted 7 organic residues for bioconversion due to their local accessibility, large economic impact, and known nutritional and physical compositions. The 7 organic waste residues include — 3 almond residues, white wine pomace, red wine pomace, tomato solids, and carrot solids. The original proposal also included 2 pistachio residues, olive pomace, onion solids, sugar beet solids, spent brewers mash, and whey. After working with these organic waste residues initially, we experienced insufficient quantities and/or logistical and storage difficulties to justify using them for large scale breeding programs. Our organic residues either come directly from the growers (Nickols Farms), processors (California Tomato Growers Association), or through intermediary colleagues in the Department of Food Science and Technology at UC Davis. The latter are currently working with these residues, have connections to residues source, and have characterized the nutritional and physical properties of the material. Experimental design: Treatments include each species completing an entire life cycle on one organic waste residue. Each candidate is paired with a minimum of 6 different organic waste residues, with 10 replicates of each treatment. Candidate bioconverters will not be matched to each of the 14 targeted residues due to intuitive constraints of the life histories of the insects (ie, fly maggots are unlikely to be reared on dry almond residues), instead we made intuitive decisions for pairing wastes with candidates. However, we anticipate success for these pairing because either, candidate species are close relatives to current converters, they have preferable life histories well suited for waste conversion, or they are already cultured in mass but have not been targeted for providing a bioconversion service. Materials and study site: Insects are reared in 2-quart plastic containers, stacked on shelving within environmentally controlled grow tents. Tents are outfitted with humidity, temperature, and light sensors wired to environmental control units. Tents are housed in a 560-square foot growing space owned by UC Davis Entomology. This space has been designated as the flagship location for developing an insect bioconversion program at UC Davis. Research methods: Using data collected for objective 1, we can determine livestock feeding potential using industry-accepted metrics for characterizing nutrient content in poultry and livestock diets. This includes crude protein, crude fat, phosphorus, calcium, ash. These data will be used to predict the metabolizable energy of the insect biomass in a poultry diet (according to the model of Garcia et al.) as an example of one feed application for the biomass. Alternatively, we are testing a method in which insect-meal produced from the breeding trials is fed to crickets as a proxy for larger livestock. If viable, this method will save on costs, allowing more samples to be processed. Bioconverters: We will breed 2 conventional converters (soldier flies and meal worms), and competent candidates from objective 1. We will consider candidate species to be competent bioconverters if their “conversion potential” is similar, or superior, to that of the 2 conventionally farmed insects (see objective 1 for criteria of competency). Experimental design: We will generate 2 large colonies (2,000- 5,000 individuals) for each bioconverter species. Each colony will be fed a different organic waste residue. Each generation, we will select ~15% of the population displaying a directional extreme of a preferred trait (body mass, development time, or fecundity). To select for body mass, we will manually select the largest individuals of that generation until we have removed ~15% of the population. These will be bred for the next generation. To select for development time, we will manually select the first emerging adults equivalent to ~15% of the parental population, excluding the other. 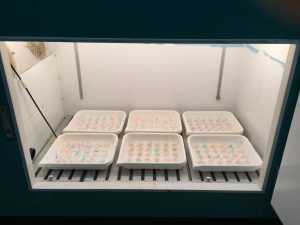 To select for fecundity (birth rate), we will manually subdivide emerging adults of each generation into 25 containers with equal number of individuals. We will provide each container with material to oviposit eggs. When possible, we will calculate fecundity of the subdivided groups by imaging eggs and comparing numbers with image processing software (image J), otherwise we will allow eggs to hatch, pooling the 4 most populous containers and discarding the remaining 21. We will artificially select a single trait over 7-22 generations, recording each generations expression at this trait. We have determined selecting ~15% the population because this allows the necessary recombination of genes for high diversity, while maintaining a strong and consistent selection to guide their evolution (following artificial selection experiments in Beldade et al.)4. Research methods: The traits measured for each population of bioconverters will be one of the following (1) body mass, (2) development time, or (3) fecundity. We will be collecting the average across the population at that generation, and the average of the ~15% expressing this trait the most. Over each generation, we will determine if these ‘improved lineages’ performance in these traits exceeds that of their initial populations. 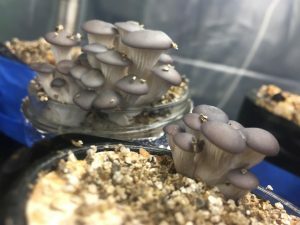 Materials and study site: Colonies will be reared in 14-quart plastic containers, stacked on shelving within environmentally controlled grow tents. Tents will be outfitted with humidity, temperature, and light sensors wired to environmental control units. These control units continuously monitor and control up to 2 separate grow tents. Tents will be housed in a 560-square foot growing space owned by UC Davis Entomology. Online engagement; We will build and maintain a web presence within our current labs website, this will provide supportive material, progress reports, and general information on the project and Western SARE. Supportive material; We will provide printable factsheets, images from the project, progress reports, and video about using insects for sustainable organic waste reduction. Outreach; Partnering with the Food Loss and Waste Collaborative we will present our findings as part of a symposium on food waste and agricultural sustainability. Further, my position as a graduate student researcher in an integrated pest management lab has connected me with growers and extension service, and has permitted opportunities to attend field days and conferences. In addition to these avenues for outreach, I will organize and present a symposium on using insects as bioconverters in food and agriculture at the national Entomologist of America meeting. Publications; We will present our findings and write about the important role insects can play in sustainability and agriculture, no less than three times, in either California Agriculture journal of the University of California Division of Agriculture and Natural Resources newsletter. In addition, we will publish our findings in either PLOS One, Innovative Food Science and Emerging Technologies, or the Journal of Economic Entomology. 1. Nansen, C. & Phillips, T. W. Ovipositional responses of the Indianmeal moth, Plodia interpunctella (Hübner)(Lepidoptera: Pyralidae) to oils. Ann. Entomol. Soc. Am. 96, 524–531 (2003). 2. Ramos-Elorduy, J., González, E. A., Hernández, A. R. & Pino, J. M. Use of Tenebrio molitor (Coleoptera: Tenebrionidae) to recycle organic wastes and as feed for broiler chickens. J. Econ. Entomol. 95, 214–220 (2002). 3. Garcia, R. A., Phillips, J. G. & Adeola, O. Improved prediction of meat and bone meal metabolizable energy content for ducks through in vitro methods. Poult. Sci. 91, 1854–1859 (2012). 4. Beldade, P., Brakefield, P. M. & Long, A. D. Generating phenotypic variation: prospects from ‘evo‐devo’ research on Bicyclus anynana wing patterns. Evol. Dev. 7, 101–107 (2005). Bioconverters: Metrics used to determine suitability to out wastes are as follows. Of the 4 conventionally farmed insects, we considered two candidate species (mealworm and soldier fly) to be competent bioconverters on our target wastes. For soldier fly, all 7 wastes can be bioconverted well enough to move to breeding trials. For mealworm, only two waste residues are suitable (white and red wine pomace), other waste resulted in too high a mortality when scaling up to mass rearing. Surprisingly, and of notable consideration, mealworm bioconversion of white wine pomace yields cleaned seeds in their frass. Unlike red wine pomace, in which seeds and skins are fermented, white wine pomace seeds still retain oil that can be extracted. Meaning, mealworms are an unexpectedly efficient and cheap seed extractor. As we move to breeding trials, large quantities of grape seeds will be extracted, and their value assessed with the overall suitability of mealworms as commercial bioconverters for white wine pomace. Of the 10 candidate species considered as potential bioconverters, only one will be moved to breeding trials (Plodia interpunctella). The other species did not meet our criteria listed above, for most the transition onto these wastes significantly increases their life span, decreasing their competence to conventional species. 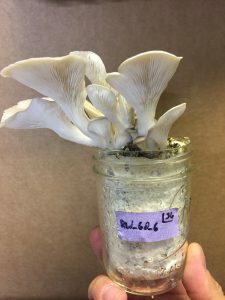 In lieu of the shortage of new bioconverters making their way to breeding trials, we have been experimenting with edible oyster mushrooms as an additional, non-arthropod bioconverter. We have successfully grown mushrooms on 5 of the waste streams, in quantities that warrant further investigation. Preliminary data suggests they perform better on the bioconverted waste remains. Meaning, we can produce two pulses of different proteins from the same waste source. Further, the remaining matter that has been serially digested by insects and mushrooms may be more suitable as a compost amendment. This increases the value of the proposed method, and will factor into the suitability as a bioconverter. Objective 2- Determine the composition and feed potential of insect biomass following rearing on different organic waste residues. Ongoing. Waste for the second year is being procured and insect colonies ramped up for breeding trials. Objective 3- Establish improved lineages using applied evolutionary techniques, with target goals of increased body mass, development time, or fecundity. Improved lineages performance in these traits will exceed that of their initial populations. Objective 4- Work together with growers, extension specialists, and researchers cooperating in this project to disseminate findings and recommendations through newsletters, and symposia, and publications. Ongoing. 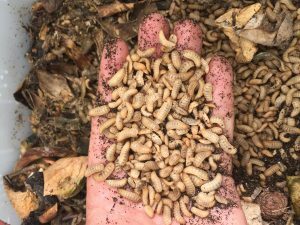 upcoming initial results from mass rearing will offer Feed Conversion Ratios for our bioconverting insects, which is information relevant for generating yields for insect biomass per ton crop waste residue, and likewise overall crop waste reduction. Those initial trials are ongoing since much of the food waste materials we use (almonds, wine, etc.) are just leaving the field, or being processed into food. Year two will include comprehensive outreach and dissemination of project results as detailed in the narrative. The first year goals of the project were to acquire new bioconverters, test them against current conventional bioconverters, and then intensively breed competent species and known bioconverters to produce more efficient strains. The first year of this project has included acquisition of bioconverters and crop waste residues, and trials to test their compliance against established bioconverters. With the harvest season for some crops fast approaching (others in progress), we are shifting to large scale breeding and bioconversion of crop waste. As such, since our justification for outreach is predicated on results of the ongoing breeding and bioconvertion, presenting to growers is a few months premature. However, the upcoming initial results can offer Feed Conversion Ratios for our bioconverting insects, which is information relevant for generating yields of insect biomass per ton crop waste residue, and likewise overall crop waste reduction. Those initial trials are ongoing since much of the food waste materials we use (almonds, wine, etc.) are just leaving the field, or being processed into food. Year two will include comprehensive outreach and dissemination of project results as detailed in the narrative.